In stock. Order in the next 9 hours, 8 minutes and it will go out today! The performer displays a folder with a picture of a library on the front. Inside the "library" are books, a table and lamp for reading, and...and... and...oops-no Bob the Book Worm! Maybe he's hiding behind some books. Meantime, the folder is laid aside, and the performer shows five giant cards depicting different kinds of books and stories you can find at the library-fairy tales, history, adventure, geography, how-to books, and-wait!-here he is!-Bob the Book Worm! But Bob is a tricky fellow, and before you know it, he has disappeared and his card is completely blank! Where is he? 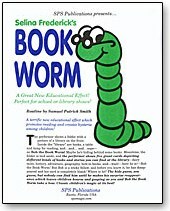 The kids guess, you guess, but nobody can find him until he makes his surprise reappearance which leaves children hoarse and gasping as you and Bob the Book Worm take a bow. Classic children's magic at its best! Comes complete with all of the necessary props.